The Artaxiad (pronounced Artashes in Armenian) was a royal dynasty of ancient Armenia. 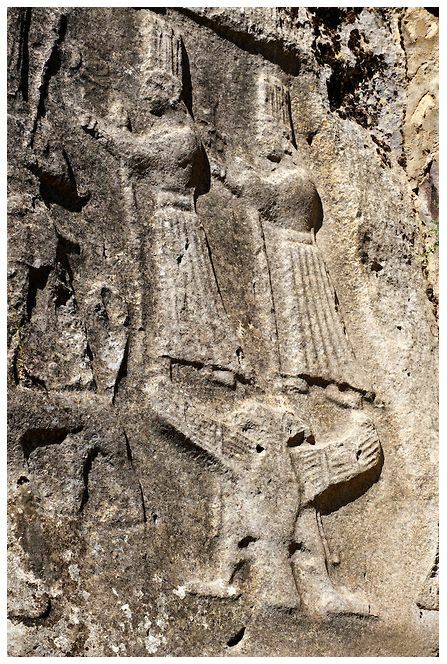 They are believed to have been related to the older dynasty the Orontids (Yervanduni in Armenian), and ruled the Kingdom of Armenia from 189 BC until their overthrow by the Romans in AD 12. Under king Tigranes II the Great of the Artaxiad dynasty Armenia has become an empire after he subdued both the Seleucid and the Parthian empires. His coins, along with those of his relative Antiochus I of the Armenian kingdom of Commagene, today are best surviving examples of the flag/coat of arms of the Artaxiad dynasty. Now I shouldn’t be too critical of the wikipedia design, after all it’s a worthy attempt and has been published free of copyrights by the author, which is commendable. But most of all I am glad that at least someone put in the effort to recreate and depict the coat of arms of the great Artaxiad dynasty. No I am not at all criticizing the author or any other artist who has attempted a recreation, I actually like much of his work that I’ve seen online. What I am disappointed about though is the fact that since the creation of this flag in 2009, for already 8 years, no one has attempted to recreate a better one. One could only wander what our historians, illustrators and artists are illustrating if not the flag/coat of arms of the most famous and successful Armenian dynasty in our entire history. I can’t say I’m a great artist or illustrator myself, but I will attempt to reconstruct the flag/coat of arms of the Artaxiad royal house to the best of my abilities, which include attention to detail, historic research and academic rigor. And while we’re at it, let’s bust another myth popularized by Wikipedia. The map of the empire that Tigranes conquered is not as it’s depicted on his wikipedia page. In fact the content clearly describes how Tigranes conquered and ascended both the thrones of the Seleucid and the Parthian empires. Most of the territories of these empires are wrongfully not included in the map used for wikipedia. See bellow a comparison of the false wikipedia map and the most accurate map of Tigranes’s II empire based on the records of several Greco-Roman sources including Strabo, Plutarch, and Pliny. Tigranes was after all called the King of Kings by authors in the antiquity, a title even the Parthian King did not receive. All those kingdoms fell under his rule, making him an emperor. If we’re to believe the incorrect wikipedia map he couldn’t have had a title superseding the Parthians or be eligible to be called the King of Kings. Now that we’ve got that out of the way, let us look first at the sources that I have used for my reconstruction and my final thoughts on why I’ve chosen the particular art style. These illustrations are of course important evidence for the shape of the royal coat of arms, but they are not very detailed because of their small size as used on Tigranes’s coins. So let us look at some other depictions of eagles and stars from the same era as used by the members of the Artaxiad family. Thus I have used these images (and more) to comprise the shape. 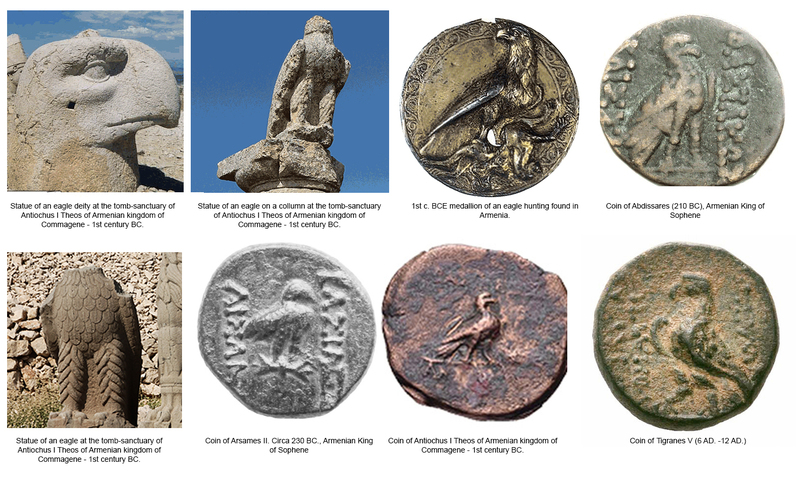 For example I have traced the shapes from coins as seen above and combined them with the more detailed illustrations of eagles from other artifacts of the Artaxiad era. Another impotent icon of the design is the star. If we look at the star illustrated on most coins, we might assume that it’s supposed to be shaped like a flower. That’s exactly how the wikipedia design of the Artaxiad flag has been illustrated. However this is wrong! Let me explain why. Perhaps due to the delicate nature of the coins and the available techniques at the time both of the endings of the rays look pointy. However if we look at some of the more detailed examples and examples from statues such as those of Antiochus I Theos of Commagene we can clearly see that the star depicted on his clothes, on slabs representing constellations and even on his Artaxiad family tiara, supposed to have pointy endings but rounded center. See some of the examples bellow. In addition we should consider the art style of the Hellenistic age in general, which clearly shows stars depicted with rounded rays from the center to more pointy ends. 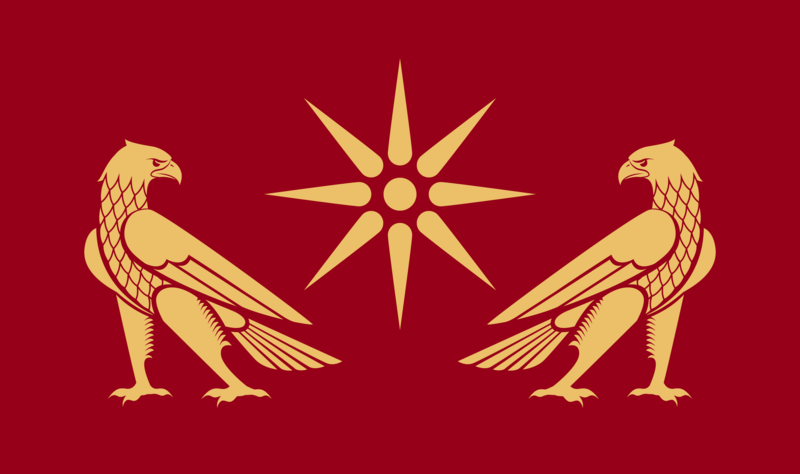 Similar to the star design of Alexander the Great. 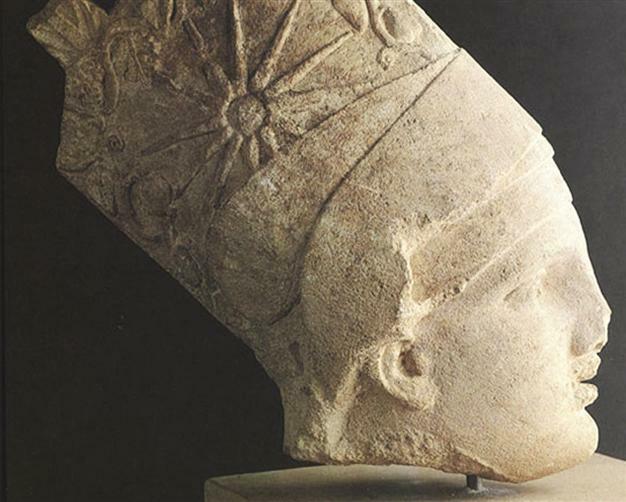 Statue of Antiochus I Theos of Commagene wearing Artaxiad Armenian tiara with a star depicted on it. 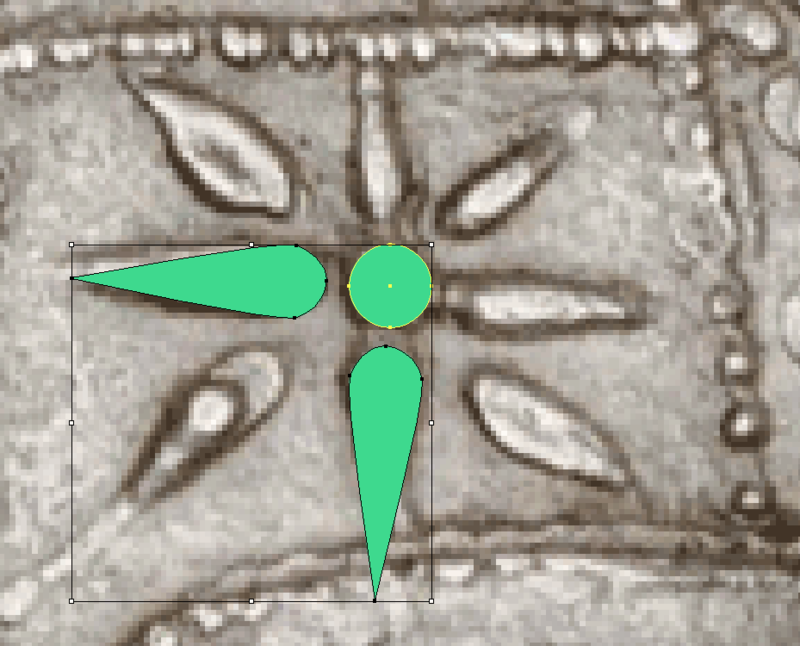 Interestingly enough the creators of the popular video game Rome Total War II got the Artaxiad star right (well partially right, they did decrease the size of half of the rays for some unknown reason). 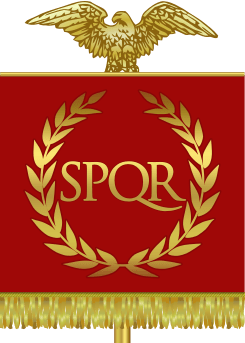 This is how they depicted the Artaxiad faction flag in the video game. See icon bellow. [UPDATE] Thanks to Narek Hovhannisyan‘s accurate feedback I have increased sizes of the eagles to fit better with the depictions on the coins and retraced the star from the most detailed coin of the Artaxiad familly, that of Artavasdes II (son of Tigranes), see illustration bellow. Yet another important aspect of the flag is the color. 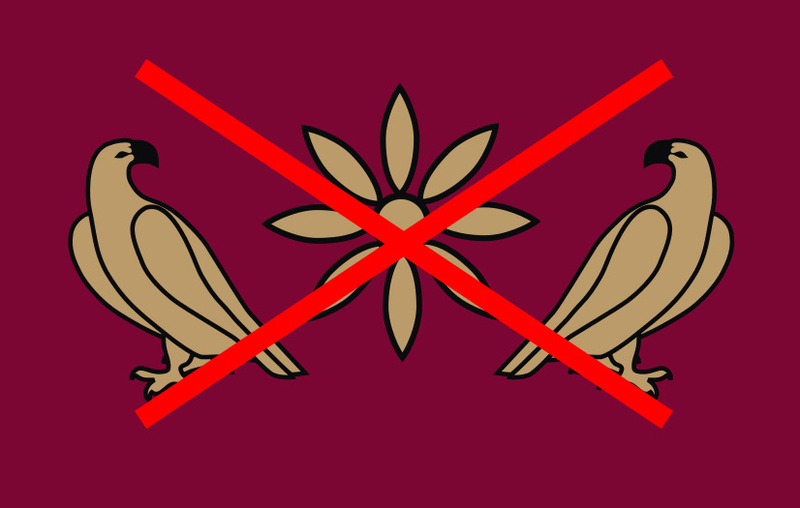 So I ask myself; what colors were originally used for the Artaxiad flag? Well, the best evidence for the colors I was able to find is from a very interesting book titled: “Nemrud Dagi: Recent Archaeological Research and Preservation and Restoration Activities in the Tomb Sanctuary on Mount Nemrud” The author of this book describes in great detail all of the research done on the monuments of one of the Artaxiad family members at mount Nemrut. The statues of deities and those of Antiochus I Theos of Commagene used to be brightly colored and researchers have found traces of pigmentation on the limestone. 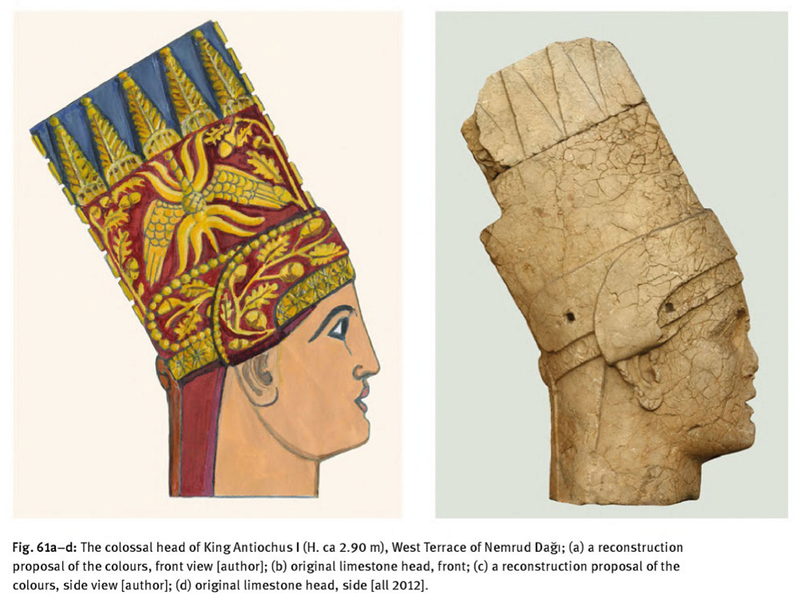 See bellow for a reconstruction based on research at mount Nemrut. What we see here is that it was quite common to use bright red as the base color of the headgear on which golden decorations were applied. We can assume that this wasn’t just limited to the Scythian culture. 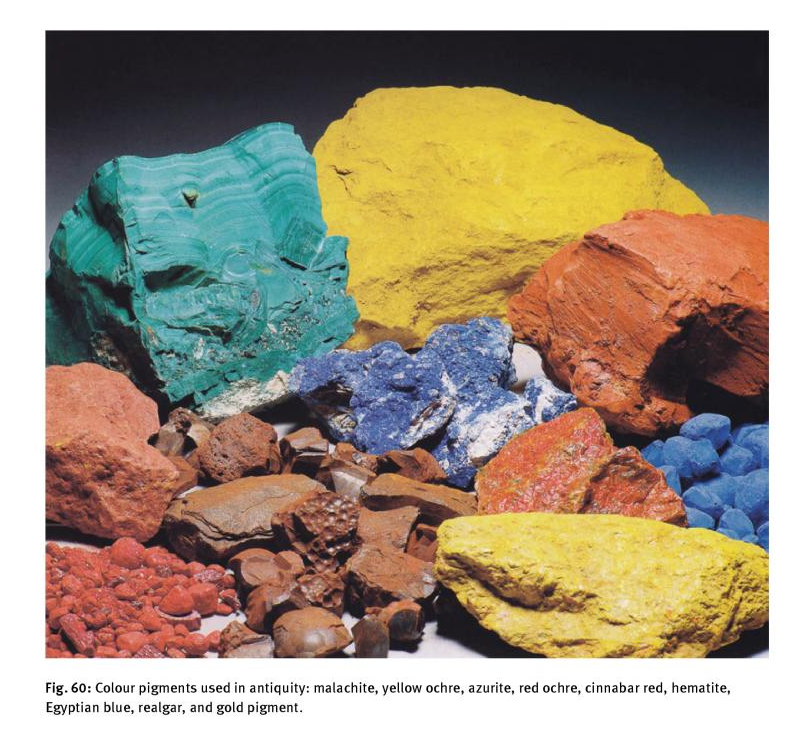 So if we take all of this into consideration, including the fact that Armenia, since antiquity, was a rich source of the red dye for the entire ancient world, due to a particular cochineal found almost exclusively on the Araratian plains as I have explained in several earlier posts such as: The search for the Armenian color – Vordan Karmir and The Red Color of Armenian Garments and Rugs, we can safely assume that the royal banners, flags and tiaras of the Artaxiad family would have used a deep crimson red color (known as the Vordan Karmir) as a base and decorated with golden illustrations such as a star at the center flanked with two reverse looking eagles. The Armenian red dye was in use as early as 714 B.C., when the Neo-Assyrian king Sargon II was recorded as seizing red textiles as spoils of war from the kingdoms of Urartu/Ararat and Kilhu. The Roman-era physician and pharmacologist Dioscorides, writing in the 1st century A.D., noted that the best insects from which the red dye was created came from Armenia. Therefore in my opinion the flag as seen in the wikipedia article has a bit too much purple and too little gold. I’ve decided to correct this in my reconstruction. The art style of the time was heavily influenced by Hellenistic art which was market by anatomical realism. 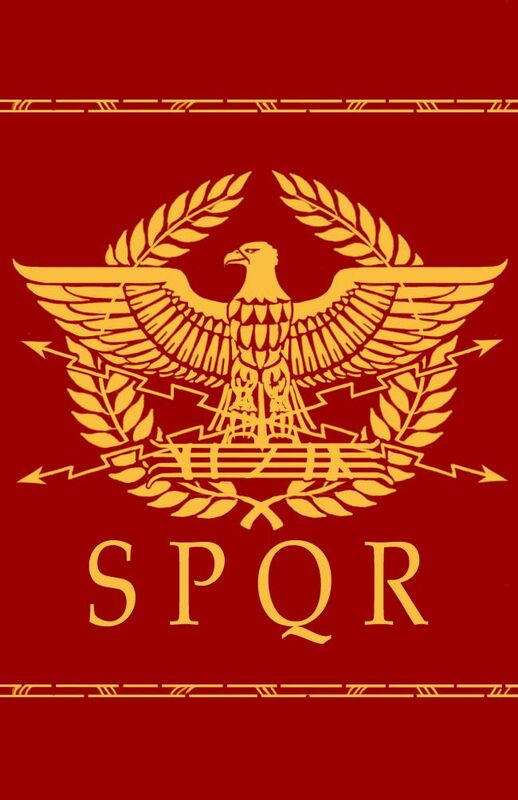 This means that the flag/coat of arms of the Artaxiad family most probably supposed to look very realistic. We can see some of it in some coins with more details. We can see clear signs of feathers and other small details. We also see the same level of details on the medallions, statues and other artifacts of the era. 1) It’s easily recognizable as a flag and/or coat of arms. 2) This style looks good in all colors against all kinds of backgrounds. 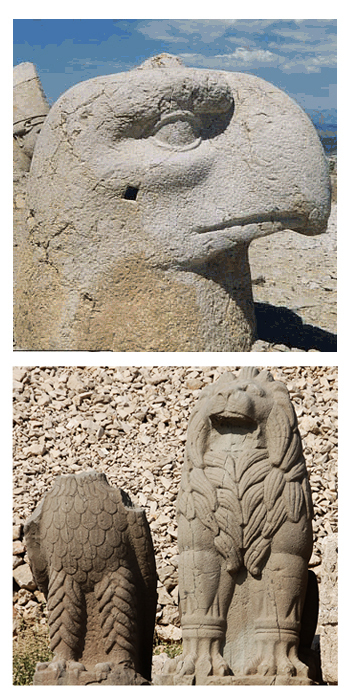 For example the statues at mount Nemrut also show some form of less realistic illustrations. The eagle and the lion seated next to Antiochus’s statue aren’t very anatomically realistic, nor is the large eagle’s head as seen on the left. In conclusion I have to say that this post is in no way a critique of the previous reconstructions floating around the internet, even if by now it might seem as such. I am glad that artists put in the time and effort to reconstruct the flag, however we shouldn’t be afraid to look at them critically and improve when necessary. My main concern is that certain incorrect illustrations are used in popular media and take on a life of their own. I hope that in the future we will keep improving the illustrations of our ancient past, and I would invite our artists and historians to take on this challenge. So considering all of the above mentioned shapes, colors, styles and to the best of my artistic abilities I have reconstructed the following image of the flag/coat of arms of the Artaxiad royal dynasty. Before I leave you with the files in several formats, I also want to mention that I release this design under Creative Commons Attribution-Share Alike 4.0 International license. This means it can be used by anyone for whatever purpose they see fit, I only ask to be attributed in the sources as PeopleOfAr and/or linked in the description. So let me know in the comment section what you think of the design, this post in general and if you’d like me to reconstruct any other flags. Some Armenians believe the double-headed eagle insignia, flag, coat-of-arms was invented in Armenia, and that Byzantium borrowed it and passed it to the Slavs. From there it spread to other parts of Europe. I have also read that the origin of the double-headed is Sumerian. Does anyone know the true story? Additionally, My belief is that the first Egyptians were actually Armenian. The Egyptian correlation I provided in the previous post is linked to the ancient Egyptian “Hawk City” known as Nekhen /ˈnɛkən/ or Hierakonpolis (again Linguistically one can see the close connection to Hayk. Hierakonpolis was built by the the Amratian culture, named by scholars after the archaeological site of el-Amra, located around 120 km (75 mi) south of Badari in Upper Egypt. Thank you! No I haven’t seen that video, but it wouldn’t surprise me, the current Armenian coat of arms is riddled with inaccuracies, and I’m not even talking about the heraldic flaws. Do you by any chance have a link to this video? And yes I will add it to Wikipedia, but first I will wait a while and see if people have some critique or some feedback for improvement. If not then I will replace the one on wikipedia with this one yes. Thank you very much for replying to my comment. I have one more question , very very interesting for me to know, what do you think: the coat of arms of the RA shoud be reconstructed or totally replaced. I am for recontrustruction , and if you’re for replacement what would tou suggest instead? Yeah totally agree, I think it needs some upgrades. I wouldn’t replace it, it’s a very interesting design as it is and the style resembles that of Urartu, which I rather like, but it certainly is flawed and needs to be corrected. Thank you very much for answers!!!! The work you are doing is very important and I am very grateful, that someone like you is interested in doing such amazing works. Thank you very much, for all your hard work. I wish I could discuss things with you, so we could share some of our experiences with each other. I am myself working on the reconstructions,currently on Erebuni fortress in 3D dimensional, including the reconstruction of all its murals etc. There are very few people that are interested in such things. What do you think about the flag of Arshakuni? Can you clarify? I am not very fond of that reconstruction either. I think it is flawed as well. Awesome work admin! I really like it. I myself considered making some banner reconstructions but it will take a while before I can make a proper one (I’m not an artist). I’m amazed how little our historians/artists reconstruct parts of our history. When I try to find what our ancient arms and armors looked like I can only find very little material. No you didn’t get anything wrong, you’re absolutely right about the banner being square. And yes it was not a flag but rather a family logo. That’s a good observation! Could you show a picture of a helmet or a manuscript of a sparapet from the era wearing such a helmet? I am quite curious. As I understood it was more closer example before. I seen it in books as well as other coats of arms. It seems that in the center there is macedonian sun/star. And eagles are not heraldic. Especially ‘coz of too detailed feet of eagles. An excellent article supported with a wealth of research! 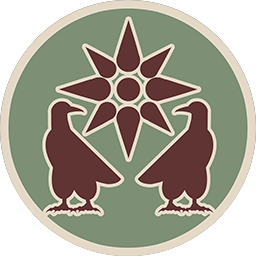 I am a member of the Society for Creative Anachronism and my focus is Ardashessian Armenia, I would like to include your design of the eagles in my heraldry and the star on my shield. You have posted several images I have not come across before, would you mind sharing your your sources for where you found so many coins and close up images of Ardashessian artifacts?